Smoothest advance ever for ignition timing. Roller bearings at the pivots of the advance weights gives the proper amount of ignition advance at the right time, every time. 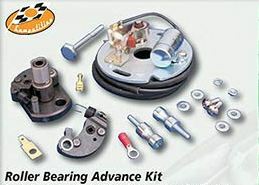 Kit includes the roller bearing mechanical advance unit, points plate, points cam, wiring harness, springs and timing screws.